Back in June 2015, we announced the release of FloodScope™, a high-resolution flood model, for InsitePro. Last week, our patent on the technology to build flood models like FloodScope was finalized. This is an exciting milestone for the InsitePro team because it is a public demonstration of the innovation we are bringing to insurance analytics. 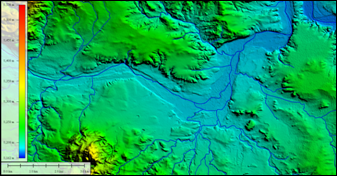 The above images showcase the FloodScope zones compared to their input digital terrain model (DTM) and river centerlines (red = RTP 20 years, yellow = RTP 100 years, blue = RTP 500 years) for a stretch of the Canadian River. 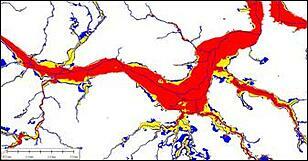 But having patented technology and a new, unique, cutting-edge flood model is only a piece of the InsitePro solution. FloodScope is a component of the custom flood risk analytics we are delivering to our customers, because underwriting flood risk needs more than a flood model.